67th Annual Pin Oak Charity Horse Show gets off to a fashionable start to lead into the show's open on March 21, 2012. This USEF designated Heritage Competition is an array of breeds and disciplines to create an equestrian sporting event like no other to benefit charities and runs through April 1, 2012. Pin Oak continues its Texas tradition of helping as it steps up and steps out for children once again. Pin Oak is a unique event bringing together world-class equestrian athletes and a community with a heart for giving to enable us to make Pin Oak more than an horse show, it is an event! What started as Houston’s hometown horse show has grown to be one of the most prestigious equestrian sporting events in North America. The Pin Oak Charity Horse Show opens its 67th annual show on March 21 and the excitement runs through April 1, 2012 at the Great Southwest Equestrian Center in Katy, TX. Each year, Pin Oak Steps Up and Steps Out to benefit Texas Children’s Hospital, Houston’s Ronald McDonald House Family Rooms, and Candlelighters Childhood Cancer Family Alliance. In other words, it is a horse show with a heart as big as Texas. With the thunder of high-stepping hoof beats and the rap and rattle of a hind leg just brushing the rail of an impossibly high jump only just a week away, the contrast of the tinkling of silverware, the brush of fine linen against skin and applause was all that was heard at the first ever “What to Wear to that Equestrian Affaire” luncheon sponsored by Land Rover Houston Central and The Houston Polo Club on Wednesday, February 29 at the elegant Wynden in the heart of Houston's infamous Galleria area. Showcasing fashions by Tootsies and models ranging for real riders and competitors to a former Miss Texas, this event was the perfect way to lead into the open of Pin Oak's 67th show opening n March 21, 2012. With Pin Oak Charity Horse Show opening less than one week away means nearly 2,000 horses and riders descend up Houston to create an equestrian sporting event like no other in the Houston area, the state of Texas or in the South. Anadalusians, Lusitanos, American Saddlebreds, Welsh Ponies, United Mountain Horses, Hunters & Jumpers, and more create a kaleidoscope of equestrian excellence for all to enjoy. In the Hunter and Jumper events, horse and rider take flight over impossibly high jumps. Andalusion and Lusitano horses virtually dance in the arena with rider in heritage costume as the lead. 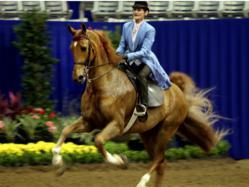 American Saddlebreds are the Peacocks of the Show Ring with their 5-gaited elegance. Pin Oak Week I March 21-25 features the various breeds and introduces a new type of competition known as Working Equitation that is taking the Horse Show world by storm. Pin Oak Week II is March 27-April 1 with all Hunter and Jumper competitions. Pin Oak has expanded in many ways for 2012, including additional USHJA National Hunter Derbies and two more Grand Prix events for a total of four. Pin Oak’s 2nd Annual Collegiate Invitational slated for March 24th at 5pm, top college equestrian teams competing in 2012 are Baylor, LSU, Texas A&M, Fresno Sate, SMU, Delaware State, Rice, and South Dakota State. Friday March 30th, a fan favorite is the $25,000 USHJA International Hunter Derby and Elegant Hat Party sponsored by Valobra Jewelry and Antiques. No horse? No problem. Pin Oak offers something for everyone inside the show ring and out. With our many ringside socials, shopping in our Pin Oak Marketplace, Education Days, Art exhibitions, and all the excitement of horse and rider in Hunter and Jumper events sailing over impossibly high jumps or Andalusion and Lusitano horses seemingly dancing in the arena with rider in heritage costume leading the dance, there is much to see and do. According to Lynn Walsh, President of Pin Oak Charity Horse Show, "Pin Oak is a unique event bringing together world-class equestrian athletes and a community with a heart for giving to enable us to make Pin Oak more than an horse show, it is an event!" Our entertaining Friday and Saturday night events, and our new Sunday afternoon Grand Prix event, feature entertainment that includes the world-famous Catalena Cowgirls, Spanish Dancing Horse exhibition by Woodlands Equestrian Club, dressage demonstration by awarding winning Pam Fowler Grace, Bayou City Pipes and Drums, the Taylor Drum Line, Working Equitation demonstration by Haras dos Cavalries, and more. Admission is free for all Pin Oak Charity Horse Show competitions except for our Saturday night events, 3/24 and 3/31, and our Sunday afternoon, 3/25, Grand Prix event where under 12 it is still free, for those over 12 general admissions is $10/person. Pin Oak Charity Horse Show has something for everyone. Another way Pin Oak raises charitable funds is through its annual raffle. A stunning one-of-a-kind necklace by Valobra Jewelry & Antiques valued at $25,000 is the Grand Prize and can be yours with a $50 ticket purchase and only 1000 tickets will be sold. The “crown jewel” of the Pin Oak raffle is an exquisite piece created in 18kt white gold, an original design by Cristina Valobra, featuring 14 briolette cut gem quality amethysts, citrine, and precious topazes for a total weight of over 75 carats, all surrounded by color sapphires and round full cut brilliant diamonds. Many more prizes can be won with a raffle ticket purchase such as an African Safari, Juliana Franco Photography Life Book, and guided wine tasting for 10-15, as just a few examples. New for 2012, Pin Oak will host the Periwinkle Foundation’s “Making A Mark” art exhibit that is a collection of paintings and drawings created by children fighting cancer at Texas Children’s Cancer Center. The exhibit will be housed in The Texas Children’s Hospital Arena Club at the Great Southwest Equestrian Center throughout the show. Horses inspire in many ways. Pin Oak Charity Horse Show hopes to inspire reading through the majesty of the horse by presenting The Literary Horse: When Legends Come to Life in partnership with the Houston Public Library. This photography exhibit by Vanessa Wright pairs photographs of today’s horses and riders with quotes from the world’s greatest books. Opening February 18, 2012 at Houston’s Central Library, this exhibit is free and open to all and will run through March 30, 2012. For a preview of the exhibit, visit http://www.theliteraryhorse.com. The Pin Oak Charity Horse Show has earned many accolades and awards. It was the first horse show in the country to be designated by the United States Equestrian Federation (USEF) as a Heritage Competition. For the 2011 show, it was voted as USEF’s Favorite Breed Show and the North American Riders Group voted Pin Oak as one of its Top 25 Shows coming in at number 9! Texas Children’s Hospital nominated the Pin Oak Charity Horse Show for a National Philanthropy Day award in 2011. With a rich heritage and time-honored traditions wrapped in Texas hospitality, what’s not to love about Pin Oak Charity Horse Show? Bring the family and enjoy some of the finest equestrian athletes in North America and from around the world competing in a variety of equestrian sporting competitions and disciplines for two weeks right here in Houston. For more information and show details, visit http://www.pinoak.org or Pin Oak’s Facebook page. You can follow Pin Oak Charity Horse Show on twitter @pinoakhouston. The Pin Oak Charity Horse Show is a 501c3 not-for-profit entity and was established in 1945 by J.S. Ambercrombie. A new generation of riders, supporters, and volunteers continue the tradition of helping in more ways than ever. Show dates are March 21-April 1, 2012, Great Southwest Equestrian Center, 2501 South Mason Road, Katy, TX 77450.